Birthday Parties. Down to a Science! We love sharing our passion for science with kids through our fun, hands-on birthday parties. A science themed birthday party is a great way to entertain kids while sharing the wonders of science... Call it, edutainment. No mess and hassle free! Customize by adding an awesome finale or two! We offer unique themes that explore science from different perspectives. Your child and their guests will join a genuine Mad Scientist in spectacular experiments and demonstrations! We can come to your house or another location of your choice or schedule your party at our Mad Science Laboratory in Bellevue. Our Laboratory is decorated with a fun Mad Science theme and includes two picnic benches for the kids. Our Mad Scientist uses a table on one side of the lab for the presentation and we have additional tables on the other side for your food and drinks. We provide plates, napkins, plastic forks and cups. The ultimate no hassle, no mess party for parents! Our lab accomodates about 15 - 20 kids comfortably. We recommend parents drop off their kids and if they want to wait nearby, we are located next door to the Bellevue Brewery which also serves food. Parties at your location can be scaled for any size. 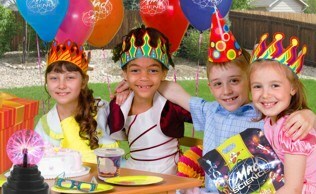 We've held customized parties for up to 60 kids. Please ask about special options for parties with more than 30 children. Our Mad Scientist will need a table for the demonstrations, access to water and a power outlet. This is a "No Mess" event... We even bring our own vinyl tablecloth. Every Party ends with slime making! 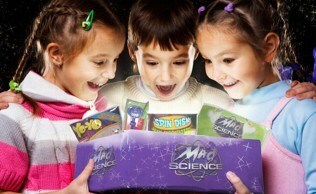 Parents will love the fact that Mad Science birthday parties are no mess and hassle-free. Our Mad Science Lab is available to host your event. Mad Science Birthday Parties are cool scientific fun!